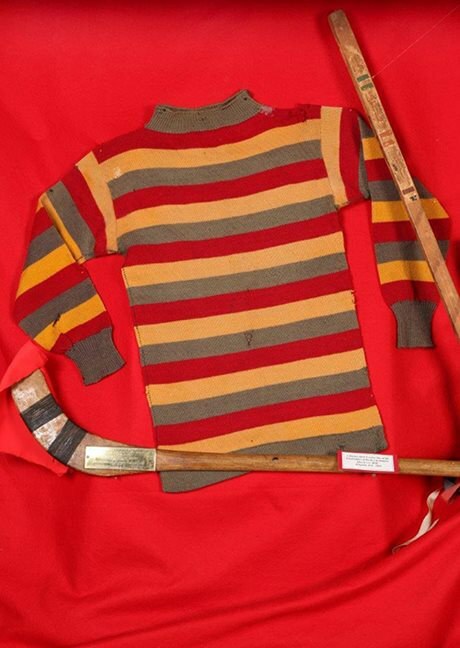 The hockey sweater is an iconic garment in Canadian sport that has become part of the national cultural identity. The team sweater brings players together with identical branding, colours and design. The only identifiers of individual athletes are their pre-determined numbers, surnames (since 1971) and captain symbols, if applicable. The sweater’s iconography has been captured in Roch Carrier’s popular book The Hockey Sweater, in which a young boy in Montreal receives a Toronto Maple Leafs jersey and not the Canadiens sweater he wants. The story displays the pride and cultural identity that people attach to jerseys, and the love for one hockey hero in particular, Maurice Richard. As popularity for hockey grew during the last century, and as more teams entered the National Hockey League, sweater styles changed. In the 1927-28 season, the Toronto Maple Leafs were the first to design and wear separate jerseys for home and away games. In 1971, surnames were added to the backs of jerseys. See the historical evolution of Team Canada jerseys at the Visit Hockey Canada website. Read a brief history of National Hockey League uniforms at the NHL Uniform Database website. Learn more about Roch Carrier and his book The Hockey Sweater from the Canadian Museum of History website.